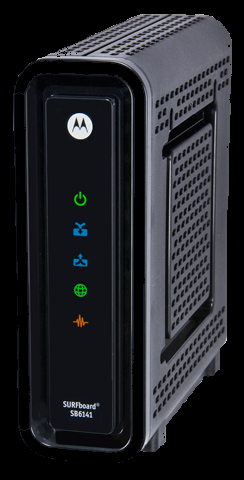 After the modem is successfully connected to the network, the Power, Receive, Send, and Online indicators illuminate continuously to indicate that the modem is online and fully operational. This information is usually found on a sticker located on the bottom of the modem. Solid Green None - connection from the computer to the Internet established on one channel. Solid Blue None - operating on more than one channel (downstream bond mode). Solid Green None - connection from the Internet to the computer established on one channel. Solid Blue None - operating on more than one channel (upstream bond mode). Solid Green None - operational. Flashing None - a single device connected to the Ethernet port and data is being transferred between the computer and the cable modem. Solid Blue None - connected to 1000 Mbps. Solid Amber None - connected at 10 or 100 Mbps. For more detailed technical information on the SB6141, see the Arris / Surfboard Support Site.